Old Navy: 60% Off Denim Shorts -6/11 7am-11am ONLY! 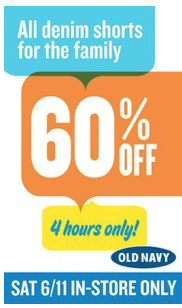 You can get 60% off your purchase of all denim shorts at Old Navy on Saturday 6/11 from 7am – 11am. This is available in-stores only. Discount is only for regular priced items.